Thanks to over a decade of experience assisting our Melbourne patients regain comfort, function, and confidence with their mouth and teeth, the highly-trained and skilled team of dental specialists at Karingal Drive Dental Clinic are passionate about improving the health of your mouth. 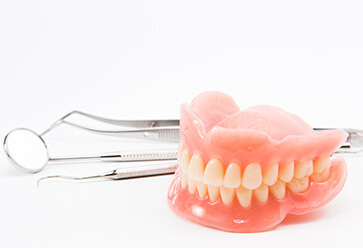 Often seen as a long-lasting replacement for patients who have had their teeth removed due to disease, accident, or other related trauma, our dentures are specifically designed to Frankston patient’s mouths. Constructed from durable and damage resistant materials, the dentures used by Karingal Drive Dental have been hand-selected by our experts. Able to help patients with chewing, speaking, improving self-esteem, as well as enhancing the visual aesthetics of patient’s faces. Dentures are highly beneficial to residents in and around Frankston. To discuss the advantages of our superior denture options as well as our tooth replacement alternatives please feel free to contact us today.